As the partial government shutdown stumbles into its fourth week, the negative impacts on everyday people are worsening by the day. Look no further than major airports across the country, where many Transportation Security Administration (TSA) agents are calling out sick instead of working without pay. The lack of staffing has even led at least one airport to shut down an entire terminal this week. On Monday, Houston’s George Bush Intercontinental Airport announced that the security checkpoint at Terminal B would remain closed for a second day, forcing passengers with flights out of the the terminal to check in and be screened at Terminal C or Terminal E. The airport first closed the security checkpoint on Sunday, citing "staffing issues" -- aka a lack of TSA staff -- at the hub. Flights were still coming and going from the temporarily shuttered terminal, but the airport has warned passengers to arrive early and expect potentially longer lines. Surely this plan has gone over well -- If there’s one thing air travelers love, it’s a mad dash from one terminal to another to catch their plane. Houston Mayor Sylvester Turner tweeted a warning to anyone heading to George Bush Intercontinental during the terminal closure. He urged them to arrive “2 hours before your flight,” adding that it was “especially important” with the airport being short-staffed. It’s unclear when the security checkpoint at Terminal B will open again, and Houston isn’t the only major city experiencing shutdown related woes. 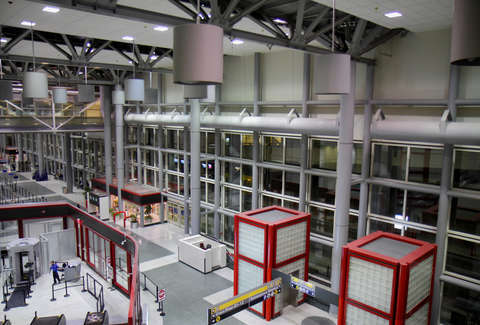 Washington Dulles International was forced to close a terminal and consolidate security screening efforts due to a lack of TSA employees as well. Officials told an NBC News affiliate station, however, that the lack of employees was due to a major snowfall in the area, rather than the shutdown. A TSA union official previously told CNN, some employees felt coming into work without pay didn’t make sense financially. Instead, they were opting to eat up their sick time to cut commuting and child care costs. Others were forced to use the time to take temporary gigs to make ends meet. The record number of TSA agent call outs has some air travelers concerned about safety standards during the partial government shutdown, which has shown no signs of nearing its end. Bilello tweeted on Sunday that “security standards remain uncompromised at our nation’s airports,” even with a lack of officers at checkpoints. This morning, TSA experienced a national rate of 7.7percent unscheduled absences compared to a 3.2 percent rate one year ago, Sunday, January 14, 2018. Most importantly, security standards remain uncompromised at our nation’s airports. While airports, and other facilities that rely on federal employees, continue to suffer, President Donald Trump accused Democrats of “celebrating the shutdown.” Despite being able to call the whole thing off, he appeared unwilling (shocker, we know) to waver without getting his way. In the meantime, federal employees will just have to hang tight. Travelers, be patient.